And now we enter into a family of birds more or less unknown to non-birders. Destined to be forever written off as ducks which which they share an affinity with water and little else, or maybe coots primarily among those who may reside near large numbers of those squabbling, aquatic rails, or more likely ignored as they slink back into the vegetation to do their business away from lookie-loos and carriers of bread bags. To know a grebe is to take your bird awareness to another level. To cast your eyes to the cattails on the edges of the pond or the raft of birds at the lake’s center and to know what you are likely to find. 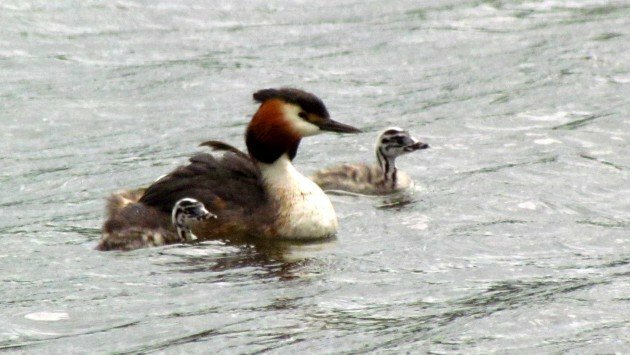 On those occasions when grebes deign to reveal themselves to non-birders they are met with confusion, because they don’t easily fit into the non-birder’s notion of an expected water bird. And truth told, over the years they’ve been something of a square peg for ornithologists too, not fitting precisely into any of the known families of birds. 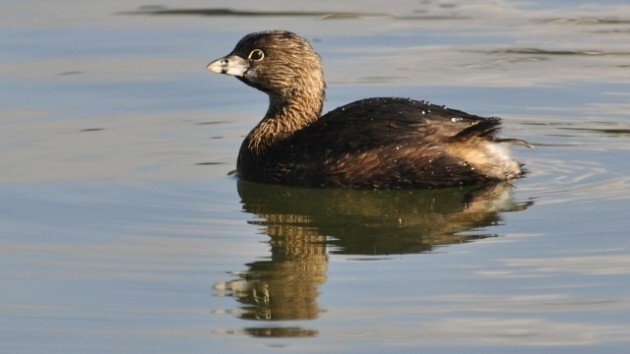 It is self-evident when watching a grebe, for instance the wide-ranging and common Pied-billed Grebe of the Americas, that this is a bird built for the water unlike any other. The feet, pushed to the very back of the body, are adorned with bizarre webbing. Not between the toes like the ducks parading on a park lawn, but on each individual toe with skin resembling an airplane flap. It is with these remarkable toes that they are propelled underwater, often at great speed and for great distances in pursuit of prey. Not enough for you? Consider their plumage, waterproof and dense like all aquatic birds, but each feather attached to their skin at a right angle with a curl to the tip which traps air against the body. 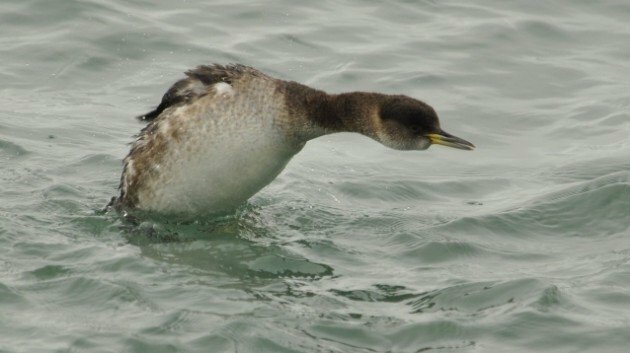 By modifying the way that the feathers lay on the body grebes are actually able to adjust their own buoyancy, giving them the ability to sink quickly and quietly beneath the surface with scarcely a ripple. Which they do. Often. 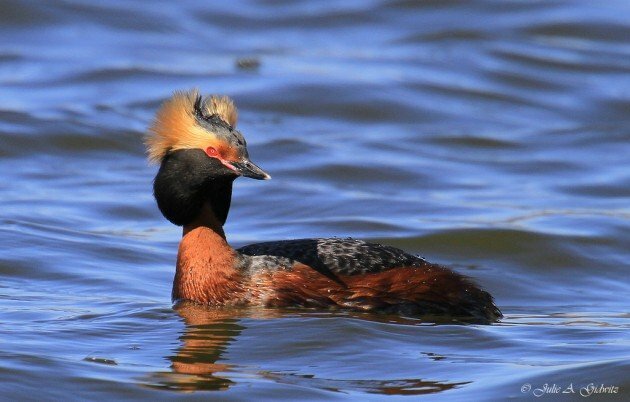 With these bizarre adaptations, is it any wonder grebes puzzled ornithologists for so long? 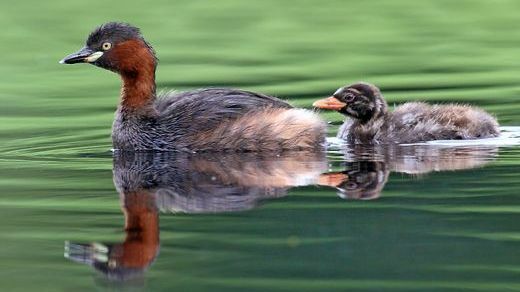 Genetic studies have shed some light on grebe’s place in the avian family tree of late, with a recent study suggesting that the closest relatives for this mostly small and subtly colored family are the gaudy flamingos. I would never have believed it, but if the science says so who am I to argue otherwise? But it seems sort of appropriate in hindsight that a family so strange would end up alongside a similarly unpredictable group of birds in the flamingos. But that’s a group for a different time. Despite their predilection for the watery realm, there are some species of grebes that are long-distance migrants. 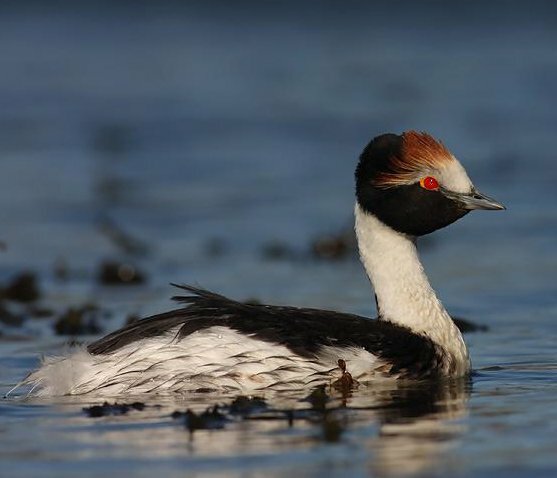 Cosmopolitan species like Horned and Eared (Slavonian and Black-necked respectively on the other side of the oceans) Grebes and Red-necked Grebe breed on freshwater bodies across the high latitudes of the northern hemisphere and turn up anywhere from sewage treatment plants to saltwater in the winter. Larger species like the Western and Clark’s Grebe of western North America, the wide-ranging Great Crested Grebe of Eurasia and the beautiful Giant Grebe of South America, are strong flyers and excellent dispersers. Even so, their awkwardly placed legs prevent them from moving around on land aside from sliding on and off their nests of floating vegetation, and birds that end up on dry land are often unable to get airborne again. With all these morphological complications on land, is it any wonder that so many species of grebe have evolutionarily given up concerning themselves about it? Many species of grebes, particularly those found on islands, like the Madagascar Grebe and the New Zealand Grebe, and those several species limited to various high elevation lakes in South America, rarely fly, with some species even having lost the ability to do so. Others are functionally flightless, if not actually so, and their disinterest in dispersing has resulted in a high rate of regional endemism and extreme range restriction in the group, with some individual species restricted to a small population on a single lake. As one might expect, these limited ranges pose problems with water quality is compromised or habitat is degraded. And grebes, more than many bird families, have an exceptionally high percentage of species that are critically endangered. 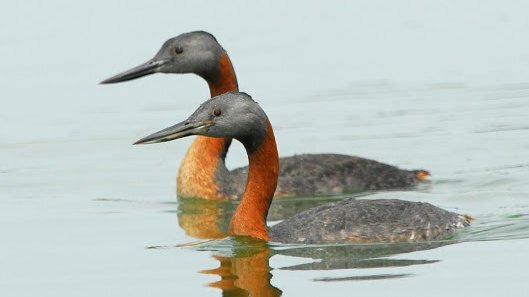 Among grebes there have been several extinctions in the last few decades, the most famous of which is perhaps the Atitlan Grebe, Guatemala’s sole endemic and a victim of various environmental wrongs over a relatively short period of time. Even those species that we consider to be stable are prone to fluctuations in population, and in their role as indicators of water quality grebes have a crucial role to play. And that’s whether people notice them or not. A really interesting post. We have Great Crested Grebes in Australia too so it must be one of the most widespread of the family. I would like to use a mount or skin for measurements if anyone knows here I can borrow one. I am going to Scotland in a few days and hope to find done good reference there on this amazing bird. Please excuse my iPhone typing! I wish I had some good New Zealand Dabchick photos. Can Eastern Canada’s Piping Plovers Be Saved?